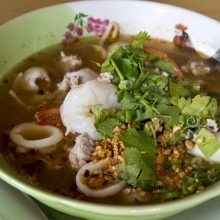 *Massamun Curry - Thai Noodle Etc. Lunch: $8.95 / Dinner: $10.50. – This curry gets its sweet flavors from cinnamon, cardamom and cloves. The sweetness is offset by tamarind, transforming the slow cooked taste of your choice of meat, potatoes, onions, carrots, or peanuts.